See the various materials used in the manufacture Verandair® products. All Verandair® verandas are made of 6061-T6 aluminium. Being lightweight but yet sturdy, it is also used in the aviation sector. It is also highly resistant to corrosion. The frames for Verandair® veranda, patio covers and pergolas are made of super-resistant aluminium profile shapes. The structure is free-standing. This means, in other words, that the use of support rails is not necessary. Free-standing structures are necessarily angular in shape. The profile shapes, which are one-of-a-kind and specially devised by our own design department, are tested beforehand by an external engineering and design office (AIB Vincotte), which performs checks for snow-resistance. The type of profile shape depends on the dimensions of the veranda as well as the geographical area where it will be installed. The Verandair® profile shapes are owned by the company and are not standardised. 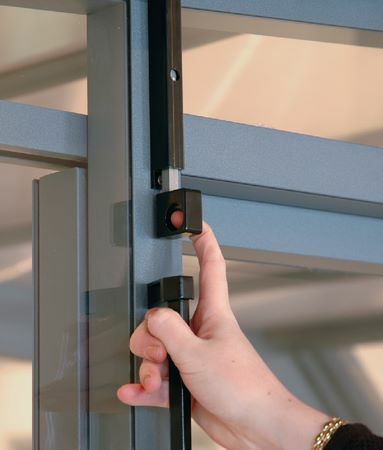 They are extruded in sections by SAPA Aluminium, a company with a reputation for reliability. All of the parts are corrosion-proofed inside and outside. 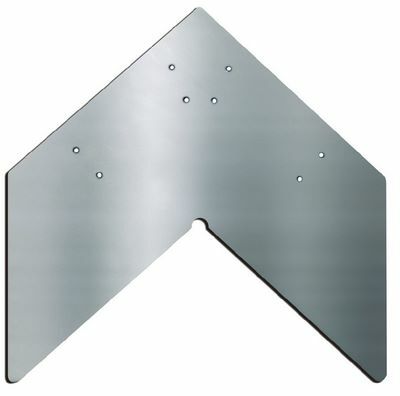 Angle brackets are used to connect the sections. These connectors are dimensioned to provide a resistance that is greater than or equal to the frame itself. They are located at every angle of the Pool Cover enclosures. Made of aluminum 7075, they are stronger than the steel itself, eliminating the breaking point. All the screws and bolts are made from A2 stainless steel. Unlike some manufacturers, we do not use zinc-coated or galvanised screws and bolts as they oxidise over time. Stainless steel enables any dismantling or maintenance operations to be performed on the enclosure even after many years. A side attach tab is integrated on each component. Chemical anchors on the stainless steel case allow this component to be fixed to the ground (in a reinforced concrete stud produced by the client). Therefore it is enough to tighten the stainless steel and plastic thumb wheel via the opening provided for this purpose. The first of these thumb wheels is fitted with a lock. The anchoring or disembedding time is approximately 10 minutes for an average enclosure of 5 components, which goes to show how easy the process is. Once the structure has been embedded by a side anchor, this component offers optimum stability in extreme winds and maximum reinforcement of the enclosure against snow load, unlike the longitudinal anchor. 2 anchor points per mobile component/4 anchor points on the fixed component. All guides are integrated into the structure and are fully concealed. Developed to customised specifications and patented by Pool Cover, they do not require any oil. Optimum working order can only be guaranteed by their cleanliness. Accessories (bolts, handles) are made from aluminium or stainless steel for the sake of quality and longevity. 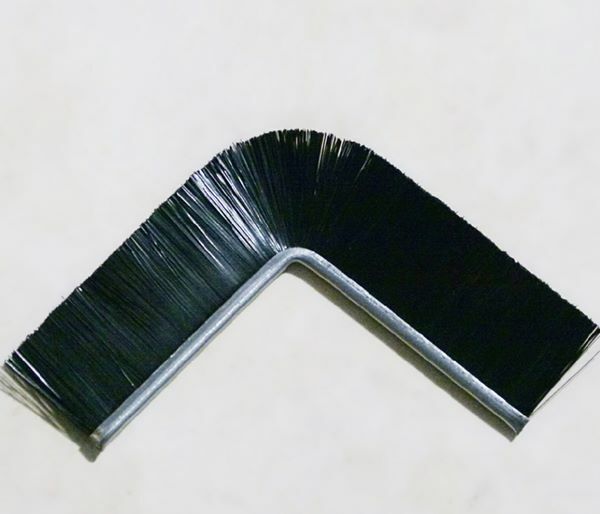 The sealing with the ground and between the components is provided by synthetic brushes with a stainless steel backing. The synthetic brush is the most suitably adapted seal to the effective bearing of the enclosure. The nylon brushes are unalterable to UV. On the side, a single system of “reverse brushes” (brushes placed on the rear and not the front section) fully eliminates friction between the components. This system will prevent any scratching on the side walls and make it easier to open the enclosure. In some cases, especially for terrace enclosures, we recommend replacing the brushes with rubber seals, which provides greater water-tightness. The inside of the enclosure is protected from draughts, leaves, thorns and dust. 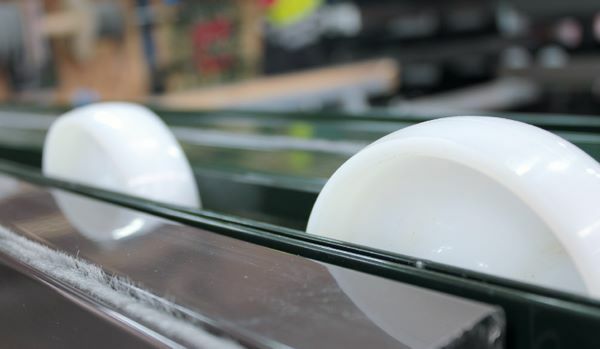 On POOL COVER enclosures, polymer seals replace silicon, which makes it possible to retain excellent resistance while increasing their life span. In standard version, SAN synthetic glazing (styrene acrylonitrile) which is 4 mm thick. The SAN is a product with very high mechanical properties, shock resistant, break resistant and highly resistant to temperature variations (from 70° C to +85°C). Furthermore, it has excellent dimensional stability, and hardly loses its shape in comparison with PMMA Plexiglas. 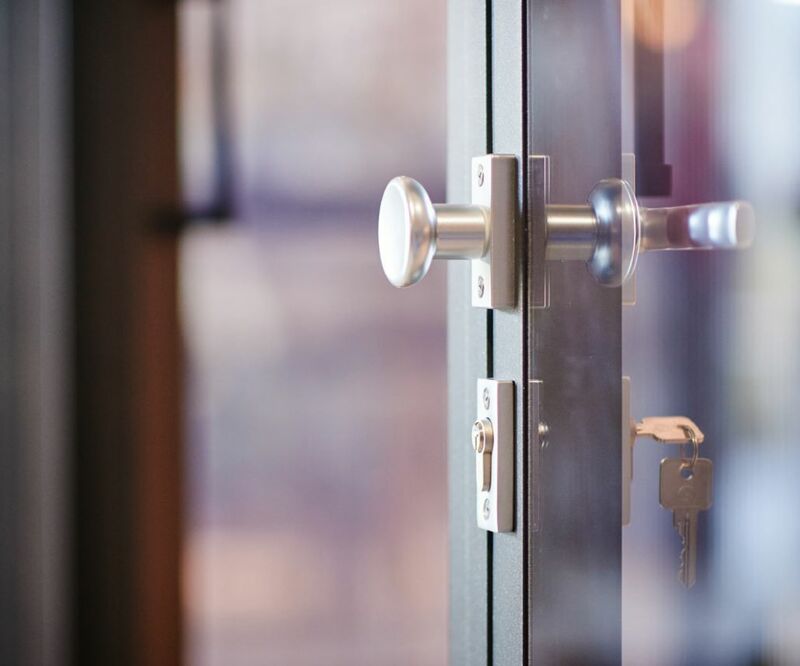 On demand, it is possible to replace SAN with PC (polycarbonate), whose sole advantage is that it is unbreakable (250 times more resistant and 4 times lighter than glass). On demand, it is possible to replace SAN with tempered glass. 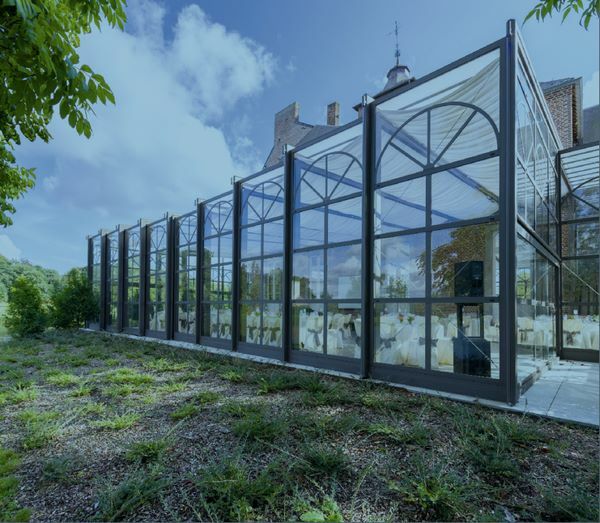 In this case, the structure section must be specially adapted, especially with the integration of glazing stop sections. 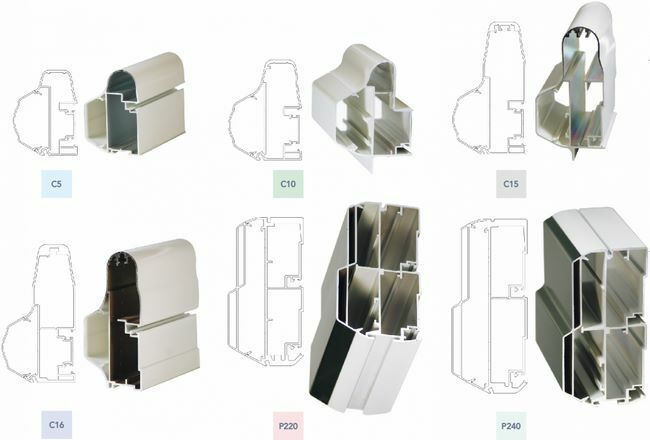 On demand, it is possible to integrate any kind of plate provided that it does not exceed 8 mm in thickness and it is compatible with our aluminium structures (expansion). Of the Lexan brand, the roof sheet is unbreakable. Its thickness of 6 millimetres intrinsically tightens the alveoles by which it is constituted, which strengthens its resistance in relation to a sheet of 12 millimetres. 6 mm is sufficient as the aim is to promote, not isolate, the greenhouse effect. It is translucent or of an opaline white colour. The UV treatment applied to the two faces takes into account the reverberation of the light on the pool water, which prevents yellowing. The roof sheets are not screwed down but held in grooves and glued. 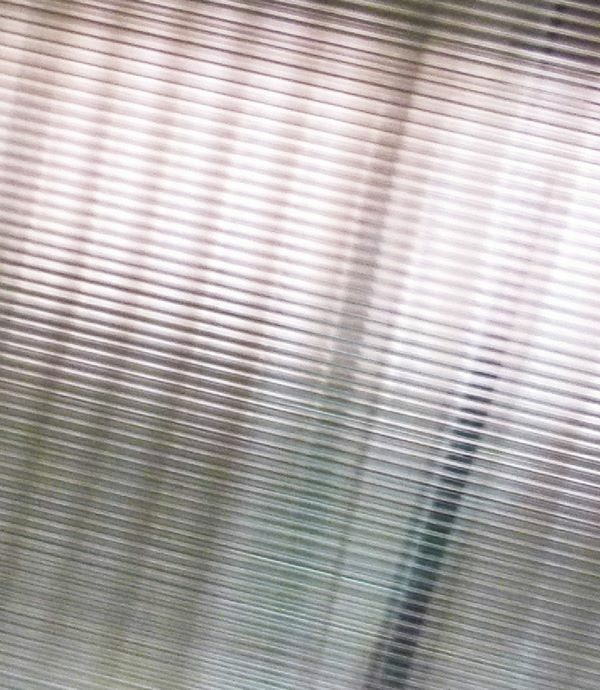 At the ends of the sheets, a micro-perforated plate is used for the purpose of the ventilation of the plate, in order to prevent interior condensation and prevent dust and insects from getting inside. Optionally, the guiding strips facilitate the attachment to the floor and stop components from becoming distorted. They are particularly discreet and have a rounded shape which removes the risk of injury. Arranged on each side of the enclosure, the floor guides may be adapted to the configuration of the location. Only the first component is guided, which means that multiple strips do not have to be installed. The elements are interconnected by a system of guiding rollers integrated into the structure. 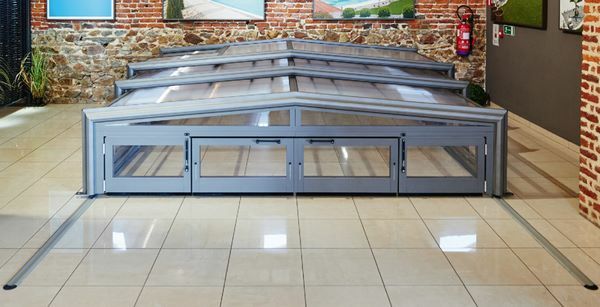 This system of rollers allows a perfect and easy sliding of the telescopic structure. The floor guiding rail is made of anodized aluminum for durability and appearance. It is fixed with stainless steel screws every 50cm. The castors are finger-mark resistant polyamide monolithic wheels mounted on stainless steel needle bearings which allow the enclosure to move very easily and protect against virtually all forms of wear and tear. 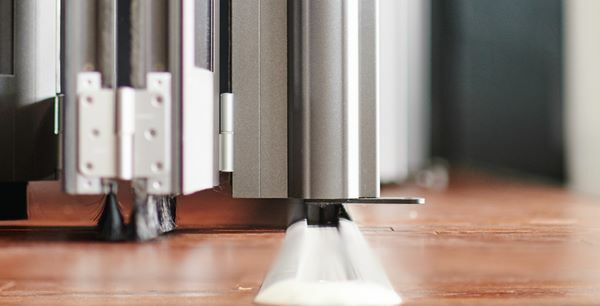 Each sliding element has 8 wheels, making movements easy and smooth.